The Global History of Paleopathology : Pioneers and Prospects. (2012). (Edited by Jane Buikstra & Charlotte Roberts). Published by Oxford University Press. Is an alphabetized description of biographies, regional investigations, key topics and organizations involved in Paleopathology. My interest in this was tied to limited work objectives. Given that I am not an academic with extensive experience in the specialization of Paleopathology I'm not really capable of providing an exhaustive review that provides an authoritative discussion on the significance of the book, but I can follow the index on topics that are relevant to my work and expand areas of interest. Think of this as a kind of review by a description of a segment of stratification layers. That said, Mycobacterium tuberculosis is a significant topic in Paleopathology, it reliably shows up in skeletal material, so was discussed in the early stages of the field's development and is now investigated by DNA techniques and other recent analytical techniques and this is where my interest in the book begins. In the biography section, Part I : Biographies, it describes the involvement of Keith Manchester, George Daniel Morse nad Mahmound Yousef K El-Najjar in the research of Mycobacterium tuberculosis. Keith Manchester investigated the antiquity of tuberculosis with Mirko Grmek and considered its relationship with leprosy (Roberts 2012 : 58). It was suggested by them that the cross immunity that exists between leprosy and tuberculosis explains the decline of leprosy and the rise of tuberculosis in Europe in the 14th century AD. As host-pathogen co-evolution led to a decrease in the virulence of leprosy, and with urbanization and increasing population density tuberculosis became prominent. For the biography of George Daniel Morse it covers his discussion of the appearance of tuberculosis in pre-columbian America, this include an early argument that the deformities in hunchback jars from the Mississippi valley did not portray kyphotic changes in the spine due to spinal tuberculosis. In retrospect this is interpreted as being strongly influenced by his everyday experience of working with tuberculosis patients (Rose & Burk 2012 : 87) which would have included involvement of a range of skeletal disorders from mild to severe, compared to the more advanced forms represented in the pottery. Artistic representations of hunchbacks is considered a significant part of the evidence of Potts disease in ancient societies, Armand Ruffer (1859- 1917) described Pott's disease in a 21st dynasty Egyptian mummy and conducted the examination of the soft tissue of a mummy to track psoas infection (Sandison 2012 : 107- 108). Mahmound Yousef K El-Najjar examined American literature and museum skeletons to conclude that tuberculosis and treponematosis was present in pre-Columbian America (Al-Shorman & Rose 2012 : 167). In the Part III : Regions section, it includes a description of the research of tuberculosis in the Nile Valley. This includes Alexander James Edward Cave's (1939) review of written documents, artifacts, art and discovered cases leading to the conclusion that tuberculosis was present in the Nile Valley and Nubia at least 5000 years ago and speculated that bovine tuberculosis may have been present in the beginning Dynastic period (Baker & Judd 2012 : 222). Allison and collaborators (1981) confirmed the research findings of Garcia Frias,which found macroscopic evidence of tuberculosis from four mummies dated to 2500 years old from the Andes, indicating that tuberculosis was present in South America before 15th century European contact (Guillen 2012 : 320). Part VI : Future Developments was quite interesting to me. It included a chapter titled "Using Ancient DNA techniques to Study Human Disease" by Wilbur & Stone (2012). It describes an issue that the key reason ancient pathogen DNA research remains quite contentious is that there has been inadequate research to determine how likely pathogen DNA is to preserve over long period of time. It is argued by Donoghue and Spigelman (2006) that Mycobacterium, such as Mycobacterium tuberculosis have enhanced preservation of nucleic acids due to their cell wall properties but it is also argued by Wilbur et al (2009) that the same cell wall properties can potentially increase the rate of degradation of Mycobacterium nucleic acids (Wilbur & Stone 2012 : 703). Tuberculosis and Leprosy have received the largest attention from ancient DNA researchers because of the antiquity and ubiquity of remains with characteristic lesions. Much early work determining the presence or absence of the pathogen in remains has used a fragment of the Mycobacterium tuberculosis complex (MBTC) specific repeat element, IS6110, and this was used to find tuberculosis like disease in a calcified subpleural nodule in a 1000 year old mummy from Peru (Wilbur & Stone 2012 : 706). The IS6110 sequence is found in all members of the MTBC, which includes M. tuberculosis, M. africanum, M. canettii, M.bovis and M. microti. Placing the organisms into a phylogenetic framework for the identification of subspecies and strain identification is problematic.There is much criticism in studies on ancient mycobacterial DNA due to lack of adherence to accepted minimal authentication protocols and a lack of replicability. Because I am writing from New Zealand, I had a vague interest in its regional description of Paleopathology in New Zealand. This is classified under the regional topic "Pacific", which makes sense from an anthropological perspective because New Zealand's pre European contact population were from Polynesian settlers around 1200 AD, despite the proximity of Australia, which the book classifies as a separate region (Pietrusewsky & Douglas 2012 : 604). Its description includes Philip Houghton's books and papers on the Prehistoric Maori and his theory that the rigors of long distance voyaging were selection factors that may have an impact on Maori and Polynesian population health issues. 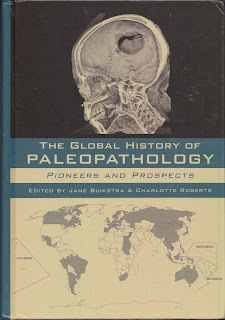 Its chapter titled "Paleopathology in Israel : Nicu Haas and his successors" was particularly interesting, which it introduces as "There is no other country where paleopathological findings expand far beyond scientific boundaries and affect the individuals beliefs, emotions and social standing as in Israel" (Hershkovitz 2012 : 426). It describes Nathan and Haas's (1963) study of caves of refuge used during the Second War against the Romans led by Bar-Kochba (133- 135 AD). The caves contained skeletal material with a small proportion of elderly and high proportion of children that tended to feature cribra orbitalia which suggests death by starvation (Hershkovitz 2012 : 429). It also features Nicu Hass's investigation of a crucified man dating between 37 BC and 50 AD in an ossuary at Giv'at ha-Mivtar, a small hill in northern Jerusalem, who was crucified in a way different from that commonly depicted in images. In conclusion, I suspect it makes a good reference and certainly represents an introduction to the topics and issues associated with Paleopathology. Al-Shoreman, Abdulla A & Rose, Jerome C. (2012). Mahmoud Yousef K. El-Najjar (1972- 2009). In The Global History of Paleopathology : Pioneers & Prospects. Published by Oxford University Press. Pages 164 -169. Baker, Brenda J. & Judd, Margaret A. ; (2012). Development of Paleopathology in the Nile Valley. In The Global History of Paleopathology : Pioneers & Prospects. Published by Oxford University Press. Pages 209- 225. Guillen, Sonia E. (2012). A History of Paleopathology in Peru and Northern Chile : From Head Hunting to Head Counting. In The Global History of Paleopathology : Pioneers & Prospects. Published by Oxford University Press. Pages 312- 328. Hershkovitz, Israel. (2012). Paleopathology in Israel : Nicu Haas and his Succerssors. In The Global History of Paleopathology : Pioneers & Prospects. Published by Oxford University Press. Pages 426- 438. Pietrusewsky, Michael & Douglas, Michele Toomay. (2012). History of Paleopathology in the Pacific. In The Global History of Paleopathology : Pioneers & Prospects. Published by Oxford University Press. Pages 594- 615. Roberts, Charlotte A. ; (2012). Keith Manchester (1938-) ; In The Global History of Paleopathology : Pioneers & Prospects. Published by Oxford University Press. Pages 56- 59. Rose, Jerome & Burke, Dolores L. ; (2012). "Dr Dan" : The Life of George Daniel Morse (1906- 1985). 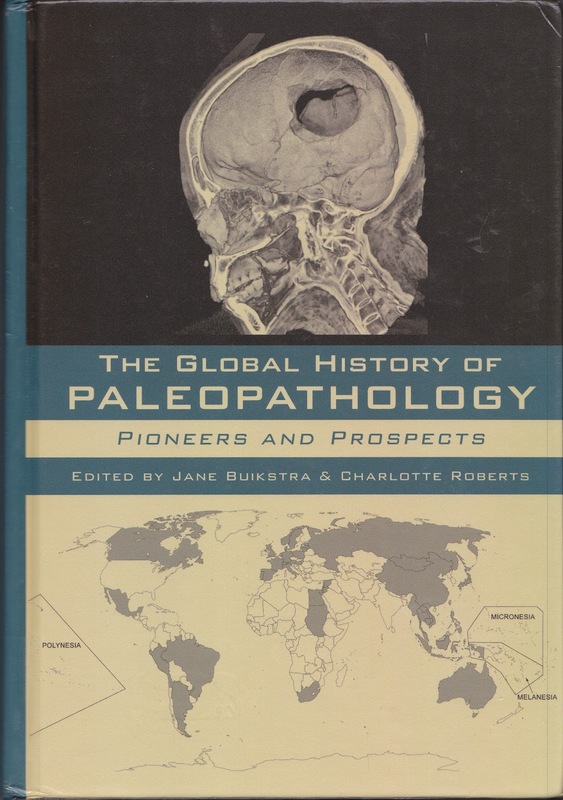 In The Global History of Paleopathology : Pioneers & Prospects. Published by Oxford University Press. Pages 82- 87. Sandison, Andrew T. ; (2012). Sir Marc Armand Ruffer (1859- 1917); In The Global History of Paleopathology : Pioneers & Prospects. Published by Oxford University Press. Pages 106- 109. Wilbur, Alicia & Stone, Anne C. (2012). Using Ancient DNA Techniques to Study Human Disease. In The Global History of Paleopathology : Pioneers & Prospects. Published by Oxford University Press. Pages 703- 717.